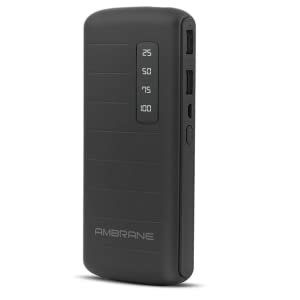 Ambrane India manufactures the world’s best power banks in India.10000mAh Ambrane Power Bank delivers on innovative Impressive design, excellent quality and high output capacity. P-1144 is compatible with almost all the smart phone, tablets. Digital camera, iPhone, media players and other Micro usb devices. P-1144 power bank are Travel-sized Lightweight, Compact, portability, perfect for backpacks or on-the-go. It’s the best way to stay charged and ready on Beaches, Restaurants and airplane etc. The high Capacity 10000mAH Power bank Provides More Charges and More than Faster, so you can charge a phone or tablet a few times and anywhere, anytime. Advance Multilayer Safety Protection Technology – It’s a high efficiency, widely compatible device that saves electricity and is protected against over current, over heat and over voltage. It has digital display screen which will show the status of its battery in the percentage form. So you don’t need to calculate the idea of the charge in the battery through LEDs. P-1144 With dual output, So you can charge 2 devices at the same time with High top speed. Made in India power bank – get a make in India power bank.